The FreeMotion EPIC Plate Loaded Squat F217 targets the muscles of thighs, legs and buttocks amongst others in the lower body. The unique contoured platform enables users to maintain correct ankle alignment and is textured to ensure stable foot placement. Contoured shoulder pads swivel and slide to comfortably fit a wide variety of users. For faster, easier and safer loading, FreeMotion offers a low plate load design. The weight plate storage bars are positioned near the load arms so users do not need to lift plates higher than waist level. And, the user-set solid steel safety locking bar can be locked into one of seven different positions for a more individualized workout. A perfect blend of functionality, safety and durability, the FreeMotion EPIC Plate Loaded Squat F217 is ideal for any gym or fitness center. Features include: Unique Contoured Platform ensures proper ankle alignment, Contoured Shoulder Pads, Low Plate Load Design, 7 Setting Saftey Stop. Call 1-800-875-9145 to speak with one of our fitness agents with any quesions you may have. Go to FitnessZone.com to order your FreeMotion EPIC Plate Loaded Squat F217. Weight plate storage bars are positioned near the load arms so users do not need to lift plates higher than waist level. Users set the lowest point in squat motion by placing a solid steel locking bar in one of seven positions. 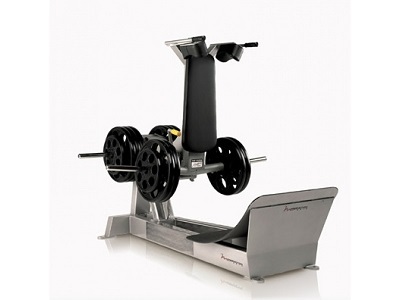 Order your FreeMotion EPIC Plate Loaded Squat F217 from FitnessZone.com today!